Last time, we introduced scopemonging — the use of gradual, planned scope expansion for political ends or to overcome organizational obstacles. By first gaining approval for something reasonable and less ambitious, scopemongers manipulate the organization into attempting something that's unreasonable or overly ambitious. 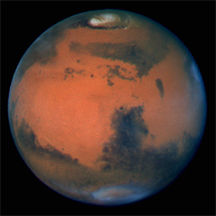 Mars as seen by the Hubble Space Telescope. The announced plan for a manned mission to Mars could be an example of scopemonging by advocates of manned space exploration. Ask yourself how many of the indicators described in this article and the previous one are possibly present in this decision. Photo by D. Crisp and the WFPC2 Team of JPL/Caltech, courtesy U.S. NASA. When the tactic is successful, scopemongers commandeer resources already committed elsewhere. They place the organization at risk, and their actions can result in severe stress and overwork for the people around them. We examined several indicators of possible scopemonging last time. Here are a few more. Sometimes, later in the project, the scopemonger asserts that we've committed such a high level of resources to the project already that we cannot "afford" to fail. Ironically, scope expansion itself often presents even greater threats to the organization than failure would [Note]. To refute their arguments, focus on increased costs and on how scope expansion threatens the probability of success. If the scopemonger has used the same tactic in the past, point to that and ask, "When will this end?" There are always those who want to carry out tasks that aren't yet budgeted or that are inconsistent with the organizational mission. Perhaps they want to work with a new technology or try a novel strategy, or there might be a feature they've long wanted to add. Scopemongers sometimes bribe these people by advocating for these items as a means of winning allies within the project team. If you suspect scopemonging, describe the bribery tactic to colleagues in advance of its use. Gain commitment to a united position opposing scope expansion by identifying bribery as a tool of scopemongers. Scopemongers also use flattery to elevate and manipulate the leading team members. They might say, "We want you to do this work, because frankly, we think you're the only ones up to the challenge." for the people around themespecially helpful when success requires beyond-the-call-of-duty effort by the people flattered. Flattery can distort judgment. It can make the flattered believe that the impossible is possible and that the unsuitable is suitable. Sometimes the organization successfully resists scope creep, and the scopemonger moves on, seeking a more vulnerable piece of the organization. Often, he or she then targets for acquisition the same resources previously targeted, now using a different project as a base. In some ways, the scopemonger behaves like the mole in Whack-a-Mole. Defeat scopemongers in one place, and up they pop somewhere else, again trying to expand the scope of some project or other. For more about scope creep, see "Ground Level Sources of Scope Creep," Point Lookout for July 18, 2012; "The Perils of Political Praise," Point Lookout for May 19, 2010; "Scopemonging: When Scope Creep Is Intentional," Point Lookout for August 22, 2007; "Some Causes of Scope Creep," Point Lookout for September 4, 2002; "The Deck Chairs of the Titanic: Strategy," Point Lookout for June 29, 2011; and "The Deck Chairs of the Titanic: Task Duration," Point Lookout for June 22, 2011. Would you like to see your comments posted here? rbrenaCHdWnUJfKbTJKbwner@ChacDlEzKyfaZKhIkCkboCanyon.comSend me your comments by email, or by Web form. I offer email and telephone coaching at both corporate and individual rates. Contact Rick for details at rbrenzYUGokBthvvOfotJner@ChacacMyGhqPpRuFvDSZoCanyon.com or (650) 787-6475, or toll-free in the continental US at (866) 378-5470.